Hello workawayers! 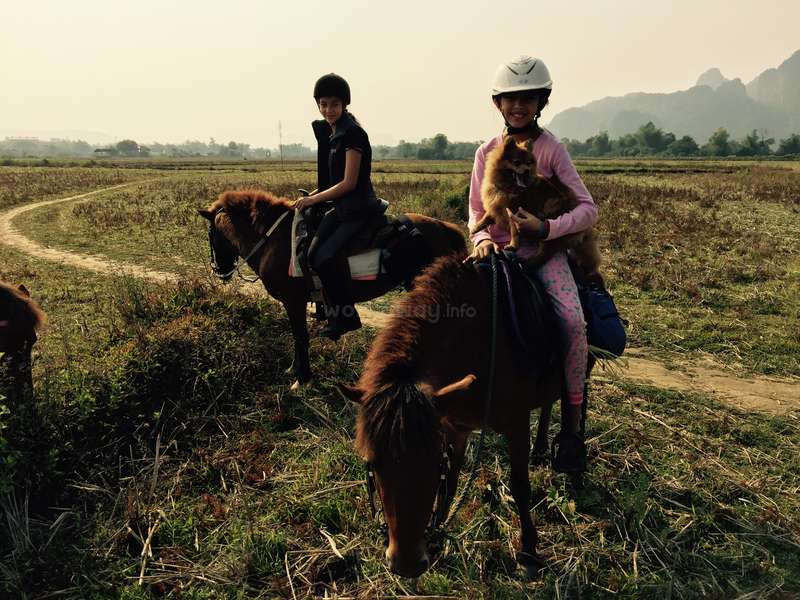 We are a Lao-Australian family owning hotels, Villas, Ponies, Cafes & Yoga in Vang Vieng. Located on the Song River by the mountains in the heart of Vang Vieng, Lao PDR! Volunteer in our ventures and have a great time meeting local people, getting your hands dirty, creating new visions, using your skills to enhance our local team to service the tourists. We practice ethnical tourism initiatives, always with efforts towards caring for the environment and sustainable livelihoods. Currently operating with a team of 60 local staff across all businesses who appreciate interaction to improve their English and technical/servicing practices. We are looking for nature lovers, professional skills, energetic people from all around the world to support our staff with maintenance, gardening, service & social media marketing, pony training and care. We also have several hotel dogs that are kind and need lots of attentionWe look forward to new team members and hope we can do great things together! Before applying please make sure you read the whole profile and that your travel plans and skills meet our volunteer availabilities. We require a minimum of 3 weeks, so please only write to us if you can commit to this. Please also understand that we do receive a lot of applications and therefore can only answer to those who match our requirements. Thanks! #Pony farm: We need experienced instructors to support our local staff on the pony farm, trekking, carriage rides, giving lessons and pony camps. 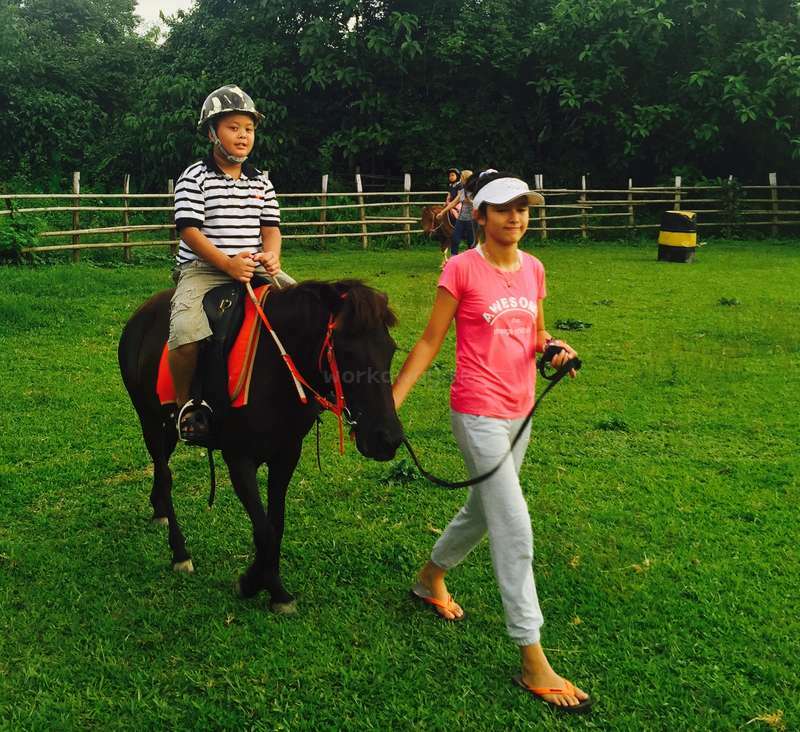 Our 9 ponies are for Childrens trekking, lessons and camps. .Daily husbandry work and maintenance around the farm is inclusive. Along with maintaining our recycling waste system from our restaurants for composting, assist in raising poultry, and tending to our vegetable gardens. We focus on growing our own vegetables to supplement our restaurants and contribute to a 'garden to plate' concept. Our aim is to reduce our carbon footprint by growing our own food and sourcing our produce locally. #Maintenance: We are looking for someone to help with maintenance (painting, carpentry, plumbing, repairing things, etc.). Projects for reusing, recycling wood and plastics, etc, would be much appreciated! You must know how to use tools and have some carpentry experience. Please be sure you are able to change pipes, fix toilets, do woodworking, and have some electrical knowledge before applying. : We are looking for an outgoing person to help with our PR, social media and marketing position. All social media pages are presently set up and need to be maintained on a daily basis. Keeping track of customer reviews and answering them as they are received is vitally important to maintaining and building our ventures reputation; organizational skills are a must. The individual should possess genuine initiative and foresight, the hotels are currently spearheading new initiatives linking to other potential clients in the region, experience in business development and consultancy would be extremely valuable for this project. Written and spoken English must be to the highest standard. Bring your own laptop. Ability to use photoshop, photography and design is a must for this position. : We are looking for an experienced Wordpress developer to help us update our websites. The sites are Wordpress powered. We have to improve and make some minor changes to our websites. Additionally we have many small design projects including the design of a pocket map, display booklet for tours, Yoga t-shirts, stickers and other merchandise. In order to be considered for this position you must submit your portfolio or some sample work you've done. Must be experienced with: Photoshop, PHP, HTML, CSS, Wordpress. You must have your own computer. #Video/film producer/editor: We are looking for someone with experience in film/editing to record different activities & events here at our hotels and bar. We want high quality footage of particular local festivals in Vang Vieng, nature, ponies, yoga & tours and multiple tour locations. Volunteers applying for this position must have their own equipment (High quality camera + Laptop) to perform tasks & duties independently to a high standard. Please send us samples of previous works/videos. *️️️️️️️*️️️️️️️*️️️️️️️This hotels means business for us and we work hard every day to make our guests happy, work towards being environmentally conscious, and work on improving our services and facilities. We count on your commitment to do the same and make an impact! *️️️️️️️*️️️️️️️*️️️️️️️If you are looking for a place to party, this isn't for you! We want mature people who take their tasks seriously. *️️️️️️️*️️️️️️️*️️️️️️️Please check availability of volunteer positions and only apply if your plans line up with our requirements. *️️️️️️️*️️️️️️️*️️️️️️️When messaging us, please provide your travel dates. We will need at least your available start date and an estimated length of stay. *️️️️️️️*️️️️️️️*️️️️️️️We require a 3 week minimum stay. To ensure we are a good fit, volunteers will need to be aware of our requirements and abide by general hotel house rules. *️️️️️️️*️️️️️️️*️️️️️️️ We take your commitment very seriously. Volunteers that DO NOT SHOW will be given a negative review. So if your plans change and you decided you are not coming please let us know. #Accommodations: Simple bedrooms with bathroom inside, fan. Depending on the number of volunteers during your stay, you will be sharing a room with 1-3 other volunteers. Volunteers will be provided with 2 free meals per day (breakfast and lunch), free wifi. We prefer non-smokers and definitely DO NOT accept party goers or any use of illegal substances. *️️️️️️️*️️️️️️️Please note that while Vang Vieng is a popular destination, it is still a developing tourist town so fresh water and electrical conservation are very important for us. Fresh public water system is sourced from mountains and a shortage is evident in the peak season our dry season. Vang Vieng is a small town on the main northern highway road 13. 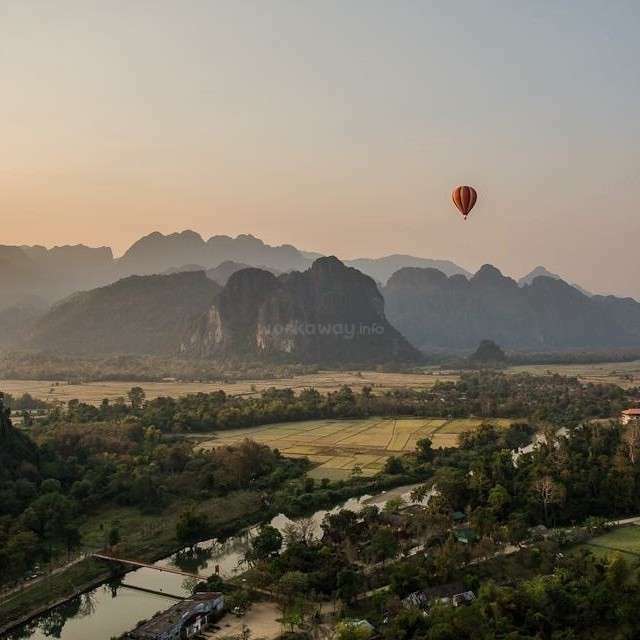 For travellers Vang Vieng is a stopover for those traveling to or from Luang Phabang, it is also a weekend getaway just 3.5 hrs drive from Vientiane City capital for locals & flying in mainly Thai, Singaporean, Korean tourists that want to experience some nature. 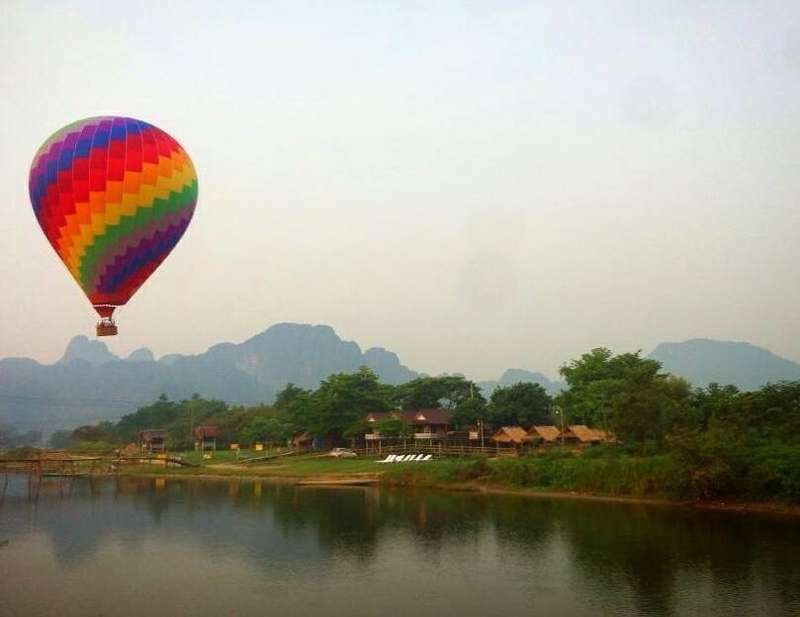 There's lots to do in & around Vang Vieng including Zip Lining, Trekking, Rock Climbing, Tubing, Ballooning and chilling in cave streams, kayaking. There are numerous caves systems only few are open & run by communities newly introduced to tourism. Our volunteers enjoy each others' company. You will make lifelong friends with us! *️️️️️️️ There are minivans and VIP buses running daily from both Luang Phabang and Vientiane. Buy your ticket in any travel agent or guest house and get picked up from your GH venue. *️️️️️️️ Once you arrive in Vang Vieng from Vientiane you can walk from the bus stop to our hotels; from Luang Phabang you will be dropped at the Northern bus station and can take a shared tuktuk for 10,000kip each. Travellers will be working closely with local people in a professional working environment and in a rural lifestyle setting. They have the opportunity to exchange language and learn local traditions. Volunteers together meet amazing people and make new friends! A minimum stay of 3 weeks up to 3 months. We prefer volunteers who are committed for longer periods. Travel insurance is required to show on application. We discourage volunteers who enjoy the party scene or use recreational drugs. We prefer non- smokers! A shared room for 2-4 persons with AC, fan, inside bathroom. Daily servicing & laundry. Buffet breakfast, lunch and WIFI. As an eco tourism destination there are many sights to discovery around the area. Once little more than a bus stop on the long journey between Vientiane at the Thai border and the World Heritage Site of Luang Prabang, Vang Vieng has managed to become a destination in its own right – and rightfully so. While the town still isn't much more than three streets and a bus station however its density is growing rapidly. The stunning scenery of river and rock formations surrounding this place will keep you dreaming of Laos long after you've settled back into real life. If you aren't into the rowdy party scene that seems to dominate this town's image, try to come in the off-season (Apr–Jun, Sep-Oct) and you'll have this place almost entirely to yourself. Son opciones de calificación adicionales para cuando los miembros dejan sus comentarios. Se muestra la calificación media dejada en cada opción. I would really like to thank Rachel and Barri again for this opportunity and I hope we get the chance to meet again ! Staying with Rachel in vang vieng and helping around here was a great experience. From the first day you feel part of the team. Always listening, helping and making sure that you feel like home. We got to meet and bond with a lot of volunteers during the two weeks we stayed there and that was fantastic. Although it's a hotel we truly felt like… read more staying in a homestay. We were working for almost two weeks and it was an amazing experience. We helped to build a little house for the ponys and we got to meet lot of local people. The food and accomodation was great, also Rachel is a really nice hist who invite us for dinner and other activities around town. 100% recommended if you like landscape, nature and if you… read more want to speak some lao language! Greg and Maja were so productive during their stay with us! They are so kind, considerate, creative and committed to completing their tasks at hand. Film making is certainly a skill they can offer helping to boost marketing and ethical businesses. Thanks so much for all your dedication! We spent 2 amazing weeks at Rachel's hotel. We were responsible for creating a promo video for two hotels. It was a real pleasure to get to know Lao culture by talking and simply spending time with extremely friendly hotel team. The surroundings of the Vang Vieng is gorgeous. 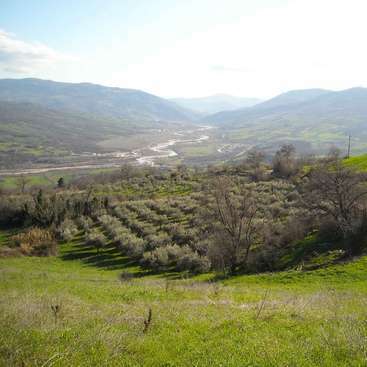 It is best to discover it by renting a motorbike and getting lost in… read more small villages. Rachel and Caroline were very friendly and gave us a lot of freedom and trust in what we were meant to accomplish. We can't more grateful for fantastic accommodation and really good food. We also got to know so many volunteers from all over the world. To sum up, it's a great place to work and make a personal development. Thanks so much once more and best luck with all your future plans! We spent two weeks and a half at Rachel’s place and we enjoyed our time there. We’ve been working on different promo videos for her business. The accomodation and the food are very good and the nature around is beautiful to discover, with a lot of activities and hikes to do. Thank you for everything and hope to come back some day! Davide and Elena are a fabulous couple, very professional, enthusiastic and independent workers! We were very grateful for their dedication and commitment to completing several promotional videos during their stay with us! I worked for four weeks in total for Rachel (I was actually planning to stay three weeks, but just like other workawayers I liked it too much ;) ). At first, I was goning to do some gardening at the hotel. Rachel gave me all the freedom to do whatever I thought was needed to fix the garden and make it beautiful again. I found it difficult to… read more really change/fix the garden. There was a lot of stuff in there which I didn't really know what to do with. Maybe the next volunteer can give it a try! Eventually I turned out working in the vegetable garden. One volunteer was going to leave, so I was happy to take over the vegetable garden. I sometimes had to help with the horses and helped out in the café. I loved the dogs and took care of them for about 2/3 weeks. I miss them already so much. The staff is very nice, funny and helpfull. I did found it difficult to saw the staff sitting wathing series sometimes, while I was working. In my last week that totally changed, so that is good! I can't really say anything about it of course, they make long hours and coocked our delicious breakfast and lunch. I my last week Berrie and Caroline arrived, they helped the workawayers and organized everything a little bit better. The only thing I really had struggles with were the tools. These broke down very easily, haha. I think that's part of the real Laos experience. Thank you Rachel, your great staff and of course the other workaways I had a very good time! I can recommand anyone to go there. Have a nice chat with the staff, discover the beautiful nature and have a great place to stay. Nick and Lilly were amazing workawayers! They were both very hard working and passionate about every task. They helped out incredibly to support our local staff in areas of IT, Housekeeping, maintenance, gardening and take care of our animals! Thank you guys for all your efforts and time! Yulia and Simon are the perfect IT social media, graphic design and systems couple! Such gorgeous people we loved having them here as a part of our business and our workaway team! Both are very independent in their fields and very creative! Thank you for your time with us! We had a great time in Vang Vieng, staying at the Hotel and working in another Hotel. It was our first Workaway and it turned out to be a great experience. We worked with social media and graphic design which let us have the freedom of choosing when and where to work. Rachel, Caroline and the staff at both hotels are really nice people. Warm,… read more welcoming and fun to be around. Big thanks to Rachel for always being available when we needed help with something. Other volunteers that were there at the same time were really cool, inspiring people. It was great to hang out and go on adventures together. What else to say: Vegetarian breakfast buffét and lunch every day, hotel room to stay in, infinity pool to relax in, yoga to attend, and many other activities to do in town and surrounding area. A big thanks for this experience in Laos! Marti was the most amazing gardener! We really appreciated every day Marti spent with us working on the gardens. A very kind and generous person, willing and able to build construct and create! Thank you Marti! Paul and Lena were the dream volunteer couple! They are both very active and interested to help with all ongoing projects including maintenance, building, housekeeping and more. Paul established a camp site for our on farm stay accommodation. Lena assisted our housekeeping to identify maintenance and aesthetic improvements besides working at the… read more farm on some days. Together they took great care for our beloved dogs. Thank you so much for all your energy and positive vibes! Wish you all the best for the future and give Beebee a big hug from us! Highly recommend Naga and Elephant for everyone! Ben and Koren were a perfect fit for Workaway with us! Both very professional, self motivated, committed and a pleasure to work with. Two of them have extensive skills and knowledge on horses, husbandry, riding , teaching and hardworking. Our herd were very well taken care of, maintained excellent condition, demeanor under Koren's care. Ben never… read more ceased to amaze us in the office , creating systems on data analysis, an excel mastermind. I would highly recommend to get this unreal couple on board!!! Miss you both tremendously! Originally we intended on staying here in Vang Vieng for three weeks, however, we loved it so much we ended up staying for seven! Rachel is a brilliant woman and it has been a pleasure to work alongside her and the other amazing members of staff. We worked in separate areas during our stay and both of us had almost complete autonomy in our roles.… read more The work with the ponies was a lot of fun, even if it is a bit of an early start. They are great to ride and the teaching aspect was very rewarding. The office based work was also interesting and we definitely had the opportunity to utilise our individual areas of expertise. Accommodation was good, a spacious and clean room with en-suite bathroom and air conditioning. Regarding food, the breakfast buffet is outstanding and lunch is made to an equally high standard. We were never lacking for anything during our stay. On a separate note, the hotel dogs are amazing. They are so unbelievably friendly and will follow you everywhere if you let them. It is almost worth visiting here just for them! A big thank you to Rachel and everyone else for making our stay such an amazing experience. I spent two weeks there in the beautiful Vang Vieng. The work was challenging for me (clean a messy staff room, painting and sanding the floors of the rooms...) but fun because of the great volunteers and rewarding because you make the place looks better. I… read more didn’t see Rachel much but she was a kind host. The room was very comfortable and the view amazing ! Thanks so much to Kim’s& Quinten for sharing their skills and experience with our team! This couple is super engaged, willing to help out in all areas needed. Perfect personalities to work with our staff, culturally sensitive, caring and inspiring! We felt very lucky to get invited to the "Baci" (beautiful Buddhist ceremony of blessings for the new year followed by copious amounts of food and drink) that Rachel and her husband hosted for the entire staff. About our volunteering here, we had several "missions" : Helping Lay and Tuk every morning servicing at "Eh Eh Café", making short videos of the ponies, the café and Yoga for social medias and working on a "vegan menu" for the new restaurant they want to open... We had so much fun working on these missions that we worked way more than 5 hours per day (as a hobby! just because we wanted/liked to). Anyway, we both higly recommend this workaway adventure ! Rachel is a fantastic host. We stayed at one of her hotels which was very accommodating towards us while we performed some accounting work for her. The work involved helping sort out the hotel's books for the last three years and train some of her staff in doing so. It was really rewarding helping out. If you have some experience in bookkeeping or… read more just a basic understanding of accounting, you can be of great assistance here. The breakfast and lunch provided was always tasty and filling. Rachel was so accommodating; down to each and friendly. Furthermore she also had six other volunteers working at the same time as us, so we made some really good friends through the process. Thanks so much for an unforgettable experience Rachel. I came to Vang Vieng with the plan to stay for 3weeks but it turned into 2months because I fell in love with the people and animals there. Training and medicating the ponies was a really rewarding work and I was able to take responsibilitys that I couldn't have taken back in germany which was a great experience. The local stuff is lovely once you… read more break through to them and you will enjoy it alot to work alongside with them. Rachel makes everyone feel like a part of a family and simply is a great person. The scenery of Vang Vieng is breathtaking and there is sooo much to do. Already looking forward to when I will come back! Big thank you and see you soon! Finally we got some time to go online and catch up with old work! Our stay in Vang Vieng was great. We were in charge of the social media, creating contents daily for the hotels, ponies, yoga and the cafe. It was a flexible work since most of the things we done online. Still, it was a pleasure to go to the office and work side by side with the Lao… read more staff. The hotels are really good. Amazing views that make you wanna stay longer. Beside social media we also redesigned the mailing list/newsletter and created some cool videos for the facebook pages and instagram accounts. We also dealed replying some reviews on tripadvisor, facebook, etc. It was a very well balanced work and on our free time we got to enjoy the nice town of Vang Vieng, the infinity pool at the hotel, the beautiful nature surroundings and spend time with the local staff and the other volunteers. We wish we had longer time there. Time really flies! Rachel took good care of us, always there ready to answer our questions or assist us in any way. We had the chance to be there during the Lao New Year, and saw from the inside the traditions and joined local staff celebrating the events. One of our best memories in Laos. The social media work might seem like a lot at the beginning. There are many things to be done, but the good part is that you never get bored, plus, since it's online you can work not only from the office, but from the pool, your room, the restaurant. We keep very good memories of our work and stay in Vang Vieng, loved interacting with the staff and other volunteers, and strongly recommend to stay there! Alicia and Clement are a wonderful couple, so positive, driven, enjoy a challenge and very reliable! We are so grateful for all their amazing dedication and inputs! Host this couple you will be amazed! These guys are amazing! We absolutely loved having Brandon and Austin (return) join us contributing to our marketing, staff mentoring, baking and organizational tasks. They are a pleasure to be with, kind, positive conversationalists and really set a fun ambiance in the team!!! I volunteered with the ponies during three weeks. The job was very pleasant; the eight ponies are amazing and the nature is GORGEOUS! During my stay we only had two costumers, so most of the time we just trained the ponies ourselves. I was well taken care of in the hotel with nice staff and a delicious breakfast buffet every morning. However, you… read more should know that since Rachel only lives in Vang Vieng half time, she probably won't be the one who recieves you and your experience depends a lot on the other volunteers who will explain the work to you and be your coworkers (Rachel is available through her phone). Of the brief encounters I had with Rachel I got the feeling that she's very caring and has a big heart. What she's doing in Vang Vieng is beyond inspiring! Another fantastic job Anton! What a great individual to host, positive, kind and helpful nature, fast and diligent worker! Thanks so much for all your inputs Anton! My experience this place and with all the staff was excellent. I'm really thankful to Rachel because she gave the opportunity to join the staff even if for only 10 days. Was a great opportunity to know more about the culture and to get better the city of Vang Vieng. The location is amazing, volunteers can enjoy the swimming pool after a working… read more day and the food is also really good, especially the breakfast. During the days I stayed there, I helped with some mainteinance jobs, especially painting some rooms but whatever task you are invited to do, just don't miss the opportunity to go and visit this place. The good will of Rachel and Barry made our first experience volunteering abroad one our most treasured memories. We enjoyed supporting the projects put forward and can highly recommend this scenic space to all those wanting to help for more than three weeks. Conor and Kelly were fabulous to have helping us with social media, IT and made short films to tell our stories. They are self motivated and organized, a real pleasure to have had the opportunity to host this couple! Cody and Alison were a fantastic enthusiastic, hardworking couple to have on board! They joined us at Horses of Vang Vieng with a myriad of professional experience and skills to contribute. They were cooperative, independent and used initiative to get things done around the place. They committed almost 3 weeks to our program and we really… read more appreciate it. Such memorable times we had working together. Definitely we hope they can come back one day. Hosting this couple is a must! Elena is amazingly self motivated, a professional in her field and willing to learn and adjust to new methods. She is a great team player and fun personality. We surely look forward to hosting her again one day soon! 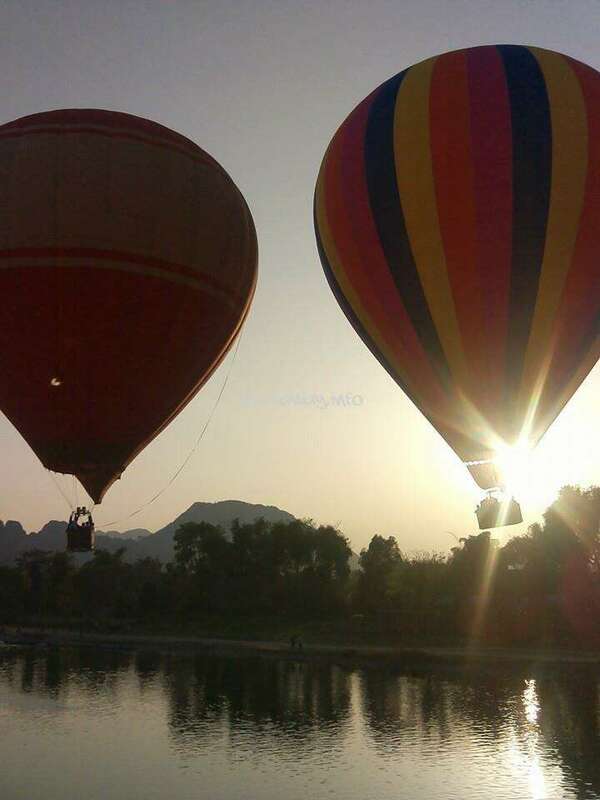 Vang Vieng is a great place, there are so many things to do! I had a wonderful time volunteering here. Rachel and the rest of the volunteers were very welcoming. I had the opportunity to work with locals and learn some thai whilst room checking in the hotel. This taught me a lot about how this type of establishment works. I spent three weeks there… read more and it flew by, especially since volunteers get free access to a beautiful pool. They people involved do incredible work and it was a pleasure just to visit. We had such a great experience in Vang Vieng with the crew. Ponies of VV and Horses of VV was an experience that I will never forget. Working with the animals was so rewarding. We loved having home like accommodations and fellow volunteers to bond with. The coffee shop was a great way to give back and build relationships with the local Lao people.… read more Rachel and her family are so active in the experience it makes you feel included and welcomed in to Vang Vieng. I recommend this experience and definitely giving yourself a few weeks as it goes by fast. Thank you for everything!! This was my first workaway experience and I spent amazing time volunteering at Rachel's hotel! I was in charge of some marketing content, the work was good and working hours were flexible. Rachel is very nice person, she has positive attitude and she was always helpful . I really liked the atmosphere and I am happy I could meet many volunteers… read more from other countries. In my free time I enjoyed delicious food, yoga classes and swimming pool and stunning view points in Vang Vieng. Thank you Rachel for everything! Hope to see you again in the future. 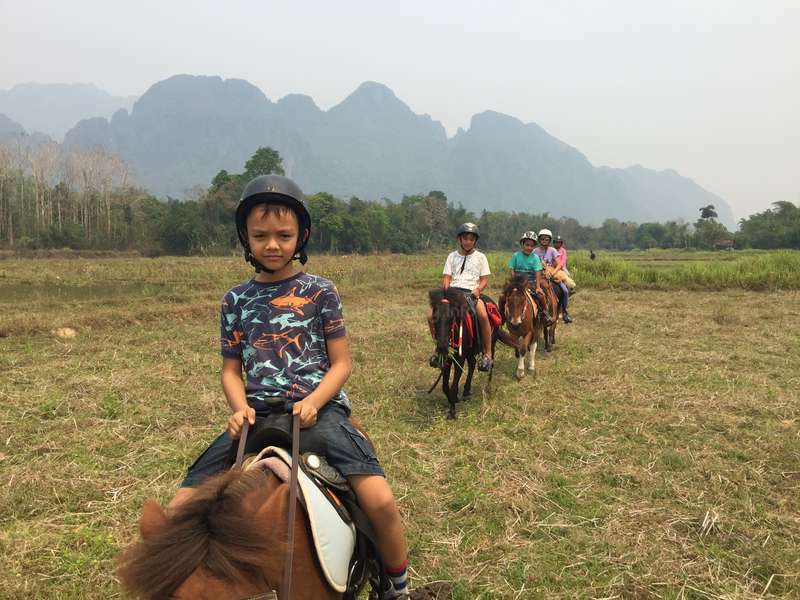 I spend more than a month in Vang Vieng as a pony keeper last october. This experience was one of my best ! 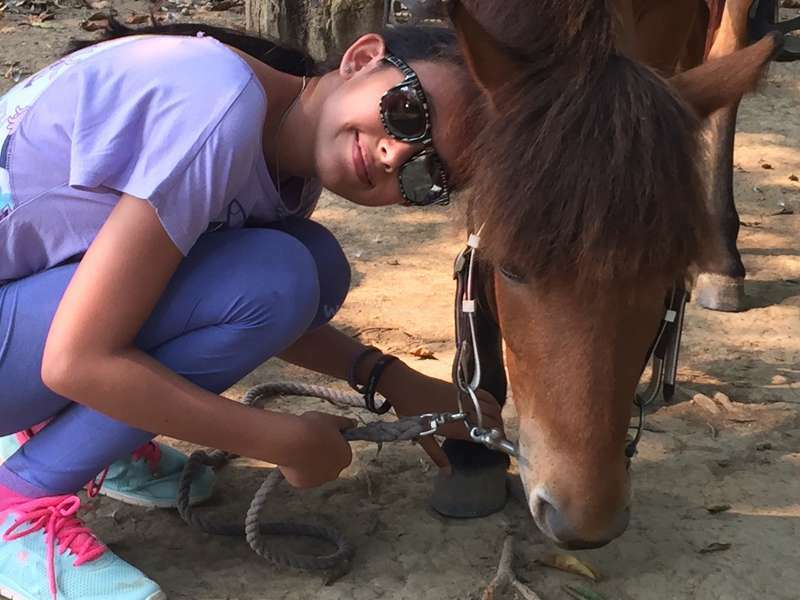 The place is so peaceful and the pony are very cute. Rachel was really nice and helpulf with me ! I recommend this volunteering !! We stayed for 2 weeks and it was a great experience. Our tasks were related to social media and accounting management. It was very interesting for us to see the real life of a big hotel management. Within our tasks and deliveries we still had a flexible agenda with plenty of free time to enjoy the city. The staff was very nice, comfortable… read more rooms, good food, and infrastructure. We wish all the best to Rachel and to the staffs and thank you for the opportunity! I haven't planed to go in Vang Vieng but Rachel welcomed me and I was able to work with the ponies. It was such a great experience. I stayed there more than one month (she extended my visa so easily) and it was a really great time. With the others volunteers we had nice time, now some of them are my friends ! The location of the hotel is… read more amazing. Countryside in Laos is one of the most beautiful I've ever seen. Rachel is very helpful even if she wasn't at the hotel during the week. I recommend that place if you want to met nice people and be a part of a lao life !! Unfortunately, Rachel was away when I volunteered in the hotel, but I had the opportunity to work on my own, and she was very available to answer my questions via email. The place is astonishing! You can't imagine. I met amazing people among volunteers and staff. The dogs there are the cutest ! I always keep good memories of this experience! I had the privilege to stay in this beautiful place for 3 weeks. I had so much fun meeting and befriending the locals and other volunteers who work at the hotel. Not only was I able to share my passion in hospitality but I also learned a lot from my experience here. Thank you so much Rachel and to the whole team! Jenna & Jari were such a delight to have volunteering with is! They are both enthusiastic, energized and thoughtful people always willing to help out. They worked very professionally without requiring supervision and contributed to supporting local staff skills. Great communicators and flexible with scheduling hours to fit the tasks demands, ie.… read more they managed their time plan painting the deck at times with little traffic. More Hosts will certainly be happy to have this couple volunteering !! We were staying here for one month and we would not have changed even one day. Vang Vieng is truly beautiful destination with breathtaking mountain views. We were happy to help Rachel and her staff with varying tasks. At first we did deep cleaning in hotel rooms and grouted bathrooms. Then we changed to painting: we painted Cafe's wall and the… read more whole terrace. Every now and then we also helped with marketing. Rachel was very good host and flexible. We wanted to have two days off per week so we were able to work six hours per day instead of five. She trusted us with tasks and hours and we had our day offs when we wanted. Facilities were very good and beyond. As a couple we got our own hotel room, which was nice. All the food was good and we enjoyed pool and discounted yoga. It was nice to get this kind of luxury when traveling for a long time. We will definitely recommend this place for anyone who is independent and hardworking. Nature lovers will like this place, since there are a lot of hiking, trekking, rock climbing and caves around. We hope that someday we are able to return to this place. Highly recommend this workaway experience in Vang Vieng! I really miss this workaway place: my work (e. g. helping to improve the local staffs service, Smalltalk and giving travel advices to the customers, painting some lanterns for the decoration in the cafe, using social media for the Hotels and the cafe), my collegues and the other volunteers,… read more my roommates, the boss (Rachel), the customers, the dogs and ponies, the landscape, the location, the amazing food! You will make a lot of friends here, some tourists even came every morning to have a conversation with me or came to say goodbye, when they needed to leave Vang Vieng. The local staff teached me how to prepare food and coffee (even lao coffee style :D). This place is perfect - like heaven. I had a very good - no awesome - month in Vang Vieng and on one day I defintely will come back. Thanks again Rachel, for all the oppurtinies and experiences you gave me! This was our first workaway experience! Rachel's hotel, restaurant, café and pony farm are all great places to volunteer. It was really great when we arrived because as JC was dedicated to the farm, I was able to help out elsewhere (mostly reception & during happy hour at the bar, but sometimes in the restaurant and café)! You need to have… read more great initiative, independance and good work ethics in order to succeed. No need to wait for orders. Although many tasks are defined, you should be able to look around to see what else needs to be done! Great staff, great food, great ponies & great landscape!! Alfredo is a remarkable professional who worked with passion. He never ceased to amaze us with his video crafting capturing our local specialities, ethical and sustainable inputs and events that we strive to maintain. He worked diligently, independently and required very little direction. In his work the interpretations and articulation really… read more impressed us we are so grateful for all of Alfredo's contributions. Most importantly, Alfredo has a unique understanding of local culture and naturally knows how to engage with local people. He is very friendly, positive and leaves us all with wonderful memories. My family and staff all look forward to Alfredo's return one day. This was my first Workaway experience and I couldn't have asked for a better host. Waking up and eating breakfast with an incredible view of the limestone cliffs and the Nam Song river is a memory I'll cherish forever. I helped Rachel make several Facebook videos promoting their sustainability efforts. She really is committed to doing things right… read more and having a positive impact on the community. Rachel is always happy to hear suggestions for improvement and never leaves room for miscommunication. I appreciate that she's always direct and clear. You'll never be confused about what you have to do. Not only that, but she really wants to make sure the experience is as rewarding as possible for you. When she found out that I was interested in learning Lao she arranged for a teacher to come to the hotel twice a week. She even sat down with her kitchen staff and told them what I was doing so that they could teach me how to make local lao dishes. (Check out the videos I made on her Facebook.) If you're looking to be immersed in nature and surrounded by kind people, I'd highly recommend coming here. Max and Andreas are such a lovely dedicated couple! Both of them so fast to learn how to work with our staff and support them with new ideas and sharing skills. Max worked both on outdoor jobs on our farm and maintenance tasks inside our hotel. He was excellent in building confidence and rapport amongst our staff team. Andreas is excellent … read more conversationalist, social media and service orientated. Warm, friendly and hard working people with lots of charisma!! I stayed here for 2 and a half weeks and worked in the little Café eh eh near the hotel. It was my first workaway experience and I have to say, it was so much fun!! I had no experience working in a Café but working with the Lao barista Lai, chatting with customers, helping preparing breakfast was fun and did not feel like work at all! Also… read more connecting with other volunteers and the staff was easy and a really good experience! This place is magical and I love to come back as soon as possible! my friend and I stay here for 2 weeks it's an amazing experience ever. rachel and her stuffs are very nice and the place was so great .we're helping in the coffee shop and some marketing, can't wait to going back there again !! Nadine was perfect for taking good care of our ponies & dogs. She enjoyed the hard work! We appreciated that she was confident and competent to provide riding lessons and guide our treks. Nadine is a perfect volunteer for animal care and outdoorsy work! Siliva & Matteo are wonderful people and we really enjoyed their nice fun energy and professional skills they had to offer. They have so much to share and have a special way to communicate and motivate local staff. Silvia worked with our Housekeeping teams to maintain high standard of cleanliness and room preparation. Her dynamic, kind and fun… read more personality really motivated staff to be proud of their work and achievements. Matteo was a blast in the kitchen, as a chef he was so helpful introducing new systems in our kitchen to help our staff be more productive and enjoy their work. We would love to have them come again someday!!! We just spent 2 really nice weeks volunteering here in Vang Vieng. Rachel and the team were very supportive and open to new ideas. I was responsible for the Housekeeping team and the hotel room's quality. My husband worked in the kitchen and helped with the food health & safety as well as cooking cakes and other meals. We met other volunteers and… read more had great time together. The town of Vang Vieng is an amazing Eco destination and there are many interesting things to do and see! In the overall it was a very interesting experience and we learned a lot about laotian language and culture! We really enjoyed the time we spent in this workaway with Rachel, her family, her family's team and all the volunteers. We had a wonderful experience teaching yoga, helping with the garden and in the coffee shop. The location, room, food, people, views and vibes are incredible. Rachel is the best host and she has a big heart and always wants to… read more help volunteers and all those who work with her to feel good and happy. Thank you Rachel! We spent 2 weeks in September here. It was our first workaway and we still regret that we didn't have more time to do some more volunteering! During the two weeks we worked taking care of the ponies, helping the girls in the Cafe and doing some other minor jobs (computer stuff mostly). It was 5 hours a day, 6 hours a week, so a little more than… read more expected, but what we got in exchange was worth it! Good food (and in abundance!) for breakfast and lunch, and a nice room. And we just have to mention the "infinite" swimming pool with a jawdropping view, free to use for the volunteers! This was my second workaway experience and it was amazing! I was in charge of the social media marketing there. The work was good, I would work every morning till 2PM and had all my afternoons off. The work environment is really nice with cool fellow volunteers. I got to enjoy all what the hotels (delicious breakfast & lunch, yoga classes,… read more swimming pool) and Vang Vang (beautiful nature, hikking, trip to the organic farm, etc) had to offer. I would definitely recommend this place! John & Kath were very focused, friendly and helpful during their volunteering with us. They both achieved and completed tasks easily and contributed new ideas. We enjoyed having them and highly recommend any new hosts to employ them. We stayed with Rachel in Vang Vieng for our first ever workaway - and it was a brilliant experience! John helped out writing volunteer role descriptions and promotional articles for Rachel's businesses while Kath provided marketing support for the yoga studio as well as hosting some Aromatherapy Workshops. In exchange Rachel provided a big… read more comfortable double room, two excellent meals a day, free use of a gorgeous infinity pool, free laundry and discounted yoga classes - thank you Rachel! However the highlight was definitely the people we met in Vang Vieng, Rachel, her family, super-friendly staff and the team of fellow volunteers and yoga teachers. Thank you again for everything - we miss beautiful Vang Vieng already! Thank you so much Vicky and Matt! You are both amazing people, both hard working, adaptable to circumstances and caring. The fruits of your labour from working in our vegetable gardens, starting seedlings, weeding, mulching trees, composting are all thriving. Matt 's excellent work painting, sanding and staining wooden floors with precision and… read more sound judgement was fantastic. I truly hope one day you can make it back to stay with us again! I would recommend you both to anyone looking for active professional volunteers! All the best!!! We spent an absolutely fantastic 2 weeks volunteering here and would loved to have stayed longer if we had more time. The task for Matt included sanding and varnishing floors and painting walls in the hotel rooms, while Vic went over the river by boat each day to feed and water the chickens, ducks and geese and to work in the garden. It was… read more exhausting working in the heat at times, but it is lovely and peaceful over the river and it was great to be outside in the fresh air, doing physical work. Other volunteers helped with the ponies, in the café, doing marketing or cleaning and tidying -there seemed to be something to suit everyone! Our hours of volunteering were from 8am -1pm 6 days a week, with our choice of which day we had off. The food was excellent and there was plenty of it with a buffet breakfast between 7 and 10am and lunch at 2pm for all the volunteers. We had use of the pool at the sister hotel a few doors down, which was wonderful for relaxing in the afternoons after work and the views over the river from both here and the restaurant are by far the best in Vang Vieng. Rachel is a fabulous host and made us feel very welcome even before we arrived. Communication about the workaway opportunity was always prompt and informative from our first contact and our skills and interests were taken into account for the jobs we were given. Rachel is also a very busy lady and although she wasn't around all the time at the hotel, she was always quick to respond to any questions or queries we had. All the local staff are lovely, friendly people and we were also lucky enough to meet some other fantastic volunteers during our stay and we all got on amazingly! Our accommodation was great, a bright and spacious private room and we could not have wished for a better location to be during our time in Vang Vieng. Rachel, we wish you the very best and hope to be able to return to help you out again at some point in the future! Sorry for the delayed feedback Rachel! I stayed for two weeks in September and I had a lovely relaxing time in Vang Vieng. Beautiful spot to stay and the hotels are both really nice. I enjoyed working in the office with everyone and felt extremely well looked after and welcomed by your family and staff. I would def reccommend to others looking to… read more volunteer here! I had a nice and relaxed time in Vang Vieng. Working in the café was the best job I ever had. ;) I enjoyed baking vegan cakes for a new eh eh offer. Thank you Rachel for your trust in my little project and this nice workaway opportunity! It was also a pleasure to work together with Lai. She is so cute, I really miss her. I wish you all the best! Brynn was amazing to have working with us. Brynn has a positive, happy & inquisitive approach to each day. She adapted really well to the poultry & pony care tasks. After a few days she was able to perform all tasks of catching, feeding , brushing our ponies as a daily routine. Who says farm work is light? Brynn was eager & determined to learn,… read more willing to work hard & was always cheerful and pleasant to be around!! We would recommend Brynn to any hosts looking for positive, reliable and caring volunteers. I stayed with Rachel for two weeks to look after the ponies! :) It was an absolutely wonderful experience. While it was more work than I expected, it was all worth it, and after a few days, I started to really enjoy it. I worked in the farm, looking after the animals, and feeding the horses. It's one of the most beautiful places, and I was always… read more looking up at the mountains in awe. Rachel is so so lovely, and I would definitely go back. So far, this is my best WA experience! Rachel is a wonderful lady and i appreciate her very much. Vangvieng is so beautiful and working on the farm with ponies during my first week in such an incredible place is truly a gift. Ali, is my favorite pony! Besides, i also give chinese lessons to some laos colleagues and this is really interesting for… read more our culture exchange. The volunteer team is like a family and i met amazing people during my 2 weeks' stay. Thanks Rachel, i wish you all the best. People: staff is very nice and Rachel is just awesome and a true kind person. There are no words to tell how thankful to her. This was our first work away experience and Rachel, you have set the bar quite high! We had a great time working here and were treated very well by both Rachel and the staff at the hotel. We met some really great people there and miss our little work away family. Thank you so much and come visit us in Ireland! Thank you Rachel for this amazing experience! I volunteered for 2 weeks in a nice and cozy café next door to one of the two hotels run by Rachel, a lovely and impressive person. I was working in the mornings so i had plenty of time to explore the stunning beauty of Vang Vieng! There are so many outdoor activities to do, you will definately not get… read more bored! I had a lovely lao co-worker, Miss LAI, i miss her already. We had great laughs teaching each other lao and english :) The work in the café is very easy and fun. I can really recommand this workaway, all the stuff is nice, the owner Rachel is a super host and the living conditions are amazing- nice comfortable room, breakfast buffet, lunch, free laundry, free pool access of one of the hotels and free yoga lessons!!! We stayed for two weeks. It was amazing and went by so quickly… we would have loved to stay longer. We can only recommend this place. It is definitely an outstanding workaway host! Rachel is an inspiring person. It’s amazing to see her juggling and developing all her businesses making smart desicions, yet having a personal relationship with all… read more her employees, being the nicest person ever AND taking the time to create some valuable work for the workawayers, so she and them get the most out of their stay. Me and my boyfriend stayed two weeks in this lovely place. I can't recommend this workaway place enough. Vang Vieng is a beautiful place where you can do lots of activities during your freetime. The people you will work with are very friendly and want to learn english. Rachel is a truely inspiring person and it is really nice to see what she… read more created! She really tries to look after her volunteers and was always available when we had a question. Our room as well as the food was absolutely amazing! I worked in the restaurant and my boyfriend worked along the housekeeping staff. I would definetely do it again!! Thanks so much to Fran and Lisa for putting in the energy and enjoying your time with us! Lisa did a good job learning how to work our cafe for 1/2 day shift 6 days a week. Fran was well adjusted to brushing ponies and being able to ride the motorbike was an asset to transporti our kitchen food waste to feed our poultry & ponies. I am sure they… read more are able to adjust to new working conditions where ever they go!!! Thanks!! Thank you Rachel for this awesome workaway! Not only did we enjoy from breathtaking landscapes and plentiful, delicious breakfasts, but we also had the chance to meet very kind volunteers and the entire staff of the hotel. Fran helped at the farm, feeding and brushing the ponies, while Lisa helped in the café. We both learned so much and had such… read more a good time that the two weeks we spent there merged into a single, long day. Depending on what your task is, the working hours are longer than indicated on that website! Also sometimes we were lacking some support with rather challenging tasks, since Rachel was gone for most of our stay. All in all we are really thankful for what we learned and for the beautiful people we have met! My boyfriend and I arrived to this beautiful place to stay for 2 weeks but we end staying 1 month. I dont have words to describe how nice is the staff, how beautiful is the landscape (my favorite in ASia!!) and specially how Rachel help everybody that she can. It was an amazing experience that We will remember always. WE were working hard but in a… read more perfect and nice atmosphere, also in town there is so many activities going on, we were there for the rocket festival and for a important ceremony of monks. The breakfast also is very good :). We will recommend this work away for sure and we will be looking forward to come back one day! A little piece of our heart stayed there. Thank you so much Rachel for all what you did and you do for the people! If you need something that we can help we will always be there! Hope to cross path again! My husband and I just finished our two week volunteering experience with Rachel in the lovely city of Vang Vieng, Laos and can't recommend this workway enough to those looking for a great experience! It was our first workaway but it definitely set the bar really high. Rachel is such an inspiring person to be around and she along with her family… read more and staff have forever left their beautiful mark on our hearts! They are so engaged in promoting responsible tourism, helping the local community, and truly care about their people. You are provided with two meals a day: the most amazing breakfast and a lovely local lunch and really nice accommodation. The work was both invigorating and challenging, which was exactly what my husband and I needed after months of travel. We met the most amazing people working at the hotel and formed quite a bond with the other volunteers as well. I was actually taken by surprise when our time came to an end by how attached we felt to the people and the town, it was really hard to say goodbye! :( We wish Rachel, her family, and all of the staff the very best in the future and are looking forward to watching how she grows her businesses from afar! It was my first time volunteering in a town than organic farms, and it was an amazing experience!!! Rachel has a beautiful spirit, she is an angel on earth. She also has breathed this beautiful soul to her whole business and staff. I met super nice volunteers and enjoyed my time peacefully. I left with tears of happiness in my eyes. You are… read more always have a home wherever I am. Pasha is a wonderful person with lots of positive energy! He is so kind, generous with his time and helped us immensely in our Cafe. We surely wish him the best in his ventures to one day develop an amazing sanctuary of his own! We hope to stay in touch and meet Pasha more than just once! I absolutely loved staying it Vang Vieng. I learned so much working on the hobby farm across the river and the Cafe and met some incredible people. Rachel, her family, and Sarah were very welcoming, helpful, and great mentors in the month that I was there. Of course Vang Vieng is beautiful and there is a lot to see an do if you are ambitious. Had… read more my visa not expired I would have certainly stayed longer. The meals and accomodation were excellent and the other volunteers there were like a small family. I really couldn't have asked for a better first experience with workaway! Conor and Virgine great to have around, always helpful and willing to put their best into any task around! Thanks again for staying with us! Our first week was spent looking after the café while the manager was on vacation. The work was fairly… read more relaxed; we made coffees and food, chatted with the customers, and kept the shop clean. Virginie spent most mornings working with the nine ponies who live on the other side of the river (they're fantastic characters!). For the second week Virginie spent more time with the ponies and I helped with general maintenance (painting and grouting). The breakfast buffet is mind-blowing: fruit, eggs, pancakes, curries, noodles, salads... The list goes on. By the time lunch came around we were often still full, but the restaurant offered hearty, healthy lunches that were hard to resist! On days where we worked longer than usual we would eat dinner in the restaurant too, but most days we would eat with the other volunteers at one of the many restaurants or food stalls on the main street. We were given our own room in one of the hotels which was really nice (one of the nicest we've had on Workaway). There were several other volunteers there while we were which gave a really pleasant social side to the project. There were always people around to eat with, go adventuring with, or just chill by the pool with. There's lots to do around V.V. if you're a nature lover. There's tubing or kayaking down the river, plenty of nice walks, rock-climbing (we tried for the first time and loved it!) and more. V.V. used to have a big, rather dark, party-town image, but the focus has thankfully shifted to eco-tourism (although you will probably still see some groups of backpackers really letting loose). 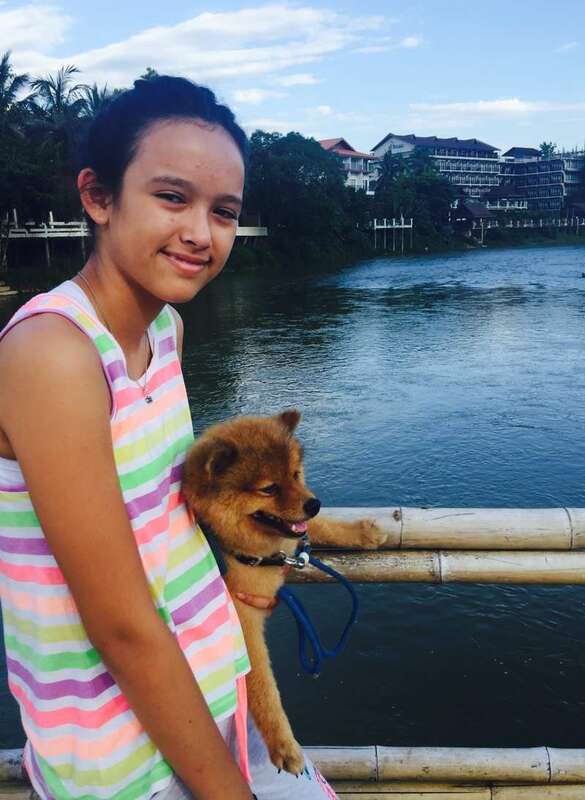 Definitely a Workaway to consider if you're an animal/nature lover, self-motivated, and want to encourage the town in a more eco-friendly direction. Thanks Rachel and everybody else in Vang Vieng! I really enjoyed so much the time working with Rachel and Sarah, very nice and welcome people! The room was very comfortable, the breakfast was really amazing, the staff of the hotel are very nice and kind! I worked on the farm in the other side of the river taking care of the chickens, gueeses and specially the ponies (brushing and feeding) and… read more gardening. I make a lot of friends during my stay that was at least 20 days. Thanks for this beautiful experience! Thank you so much for a great workaway experience. Our two week stay was fantastic, we were working on the other side of the river doing mainly maintenance work ( building fences, keeping paddocks clean...) and being able to help out with the ponies was the highlight. They are such characters and a great pleasure to pamper. All the staff are so… read more nice, friendly and helpful. Always available to practice some English! We have to say it: the breakfast buffet was definitely AMAZING! And the room for ourselves really awesome. We Highly recommend this experience! Thank you so much Lotte for all your hard work! As a last minute placement Lotte and Adriana learnt so quickly to manage the daily routine around our Pony Trekking farm. 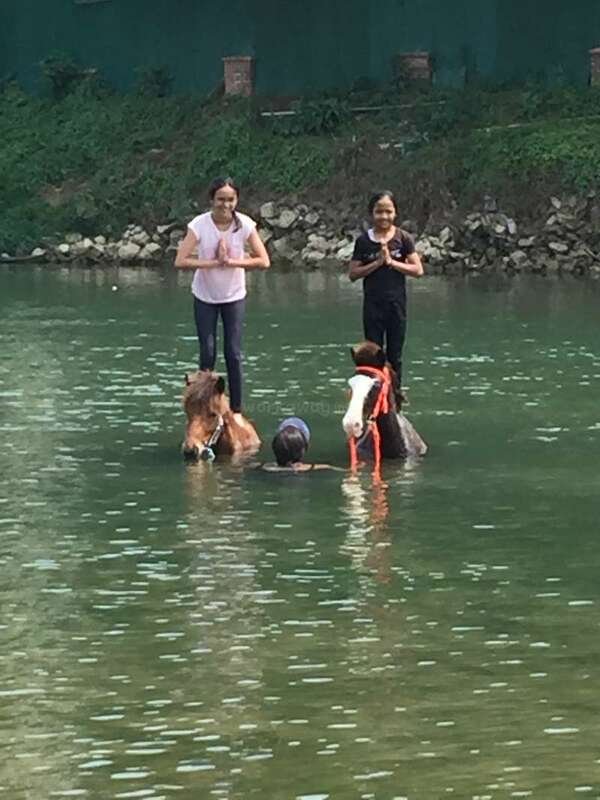 Quickly they mastered the horse husbandry, cleaning, caring & feeding poultry tasks and steering our paddle boat across the river! 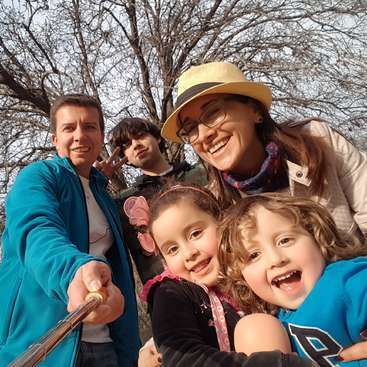 Thank you so much for your efforts and we hope… read more you find many more fun experiences with Workaway! Dan and Emily were wonderful to have here with us! They are both friendly, approachable and service oriented people. They have loads of energy and professional skills : Dan helped out to improve our restaurant / bar management systems and mentored the local staff giving them refreshing ideas and motivation in their work. Dan was able to run a… read more training session for staff on servicing & up-selling. His broad background in the tourism and hospitality industry meant he had excellent understanding of our workload/issues and he was more than willing to help. Emily was amazing working with our Housekeeping staff, even though they didn't have an interpreter Emily was able to connect and communicate very well with on-the -job training. Emily also helped out in the restaurant on busy nights. As well as the productive side a great friendship has been made. See you both again! We've just finished our first workaway experience at this hotel, and although challenging at times, was thoroughly enjoyable! Rachel and Sompanh are incredibly welcoming and very nice to work for. Work wise we were helping out around the hotel (reception, restaurant, housekeeping) and were pretty much left to use our initiative. There were several… read more other workawayers there at the same time as us so chance to meet fellow travellers and make friends! Something tells me we'll be back at some point, we'll probably be going to visit Nanny in Oz as well! 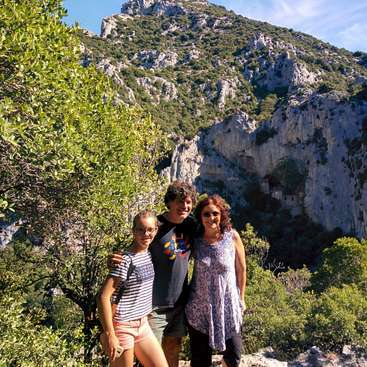 Rachel, her family, and the entire staff made this workaway such a pleasant, rewarding experience. The scenery is breathtaking, as is the buffet breakfast... We spent two weeks here helping out in the bar and restaurant, as well as teaching the cooks a few western desserts! After learning more about Rachel's life, she is truly inspiring. highly… read more recommend!!! Thanks again, see you sooooooooon! 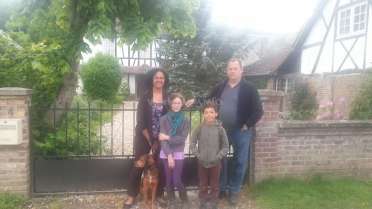 We loved having Selma and Sergi stay with us and work on our eco-farm. They both worked hard with daily tasks caring for ponies and gardening. Enthusiastic and active to work hard and help with tasks where needed. They are a generous, creative, lovable couple. Great with kids and willing to share their skills with children too. Our family values… read more their enduring friendship! If you should be coming to Munich, you and your family are more than welcome at my house! 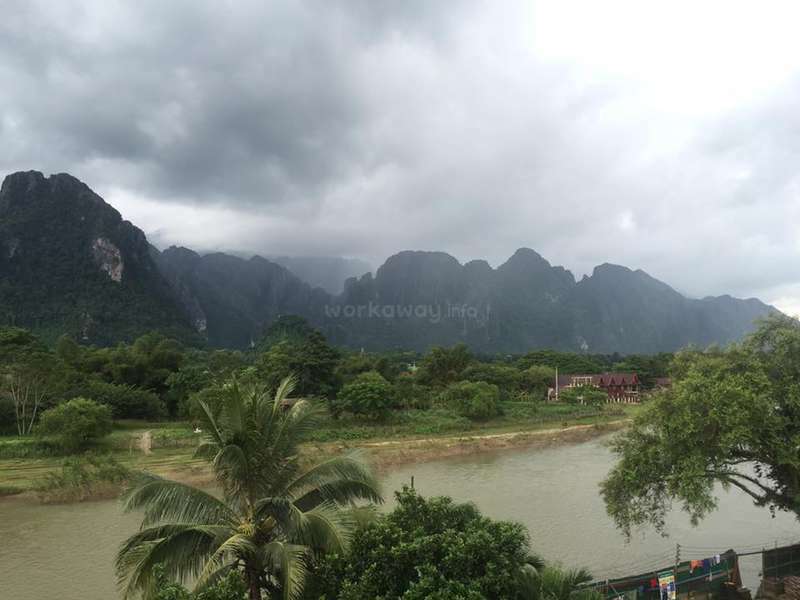 I had the best experience in vang vieng thanks to Rachel and her team.I highly recommend workaway with them! Thanks for everything! Thankyou Jimmi & Sara for all your inputs, commitment and patience!!! As a first workaway experience, we just can say it was amazing! We had a great time there. We stayed for two weeks helping in the restaurant and in the coffee shop, both great places to give a hand while enjoying your time in Vang Vieng. 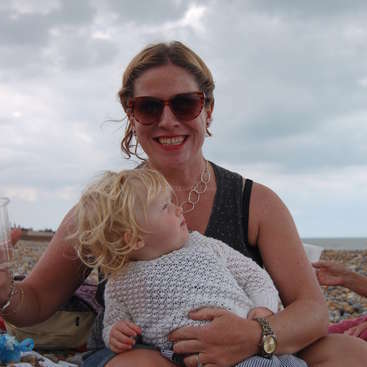 Rachel was so kind and flexible with us, she introduced us to all her family and the staff, with whom we had a… read more great lunch all together for Christmas! :) We also had the chance to bake some cakes and cookies for the coffee shop. There you can find the best coffee in town, served by Jack! We are gonna miss you all! We loved having Galatee and Martin come to volunteer with us! They are truly wonderful people with a lot of personality and skills to share! They worked so well with our local staff and everyone was sad to see them leave. Martin contributed to IT and computer issues as well as odd jobs in maintenance and gardening. Galatee is a people's person… read more with loads of smiles and assisted to train staff in problem solving, Enlgish skills, dealing with guests, and rooms checks. We look forward to the next time we can share their company! Rachel her familiy, Sarah, Bee, Tong-Souk, PingPong, Poukamh are truly amazing people who we had the chance to get to know during our stay there. Unfortunately we cannot take them home to Europe with us :-) . We felt very welcome by everyone and we were fully motivated to give back as much as we could. The breakfats was heavenly. By far one of the… read more best we got in SEA. Gabriele and Enrica are both creative, artistic, gentle and hard working people. We enjoyed their company and appreciate the work they accomplished. Gabriele has introduced us to his amazing music on the handpan as well as many durable hours on our Pony Farm. Enrica worked hard leaving us with tangible products in our business developments. We… read more value the memories and ensuring friendship! Thank you both so much!